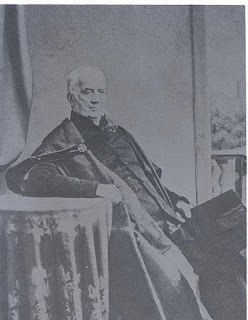 When you hear the name Charles Thorp muttered in and around the parish of Ryton these days, it is almost always in connection with the secondary school bearing his name in the heart of the town. The recent renaming process of the said institution has helped, if nothing else, to bring back to the fore the distant memory of a man who led a quite extraordinary life – and most certainly put Ryton well and truly on the map in his day. Born in Gateshead in 1783, Thorp led an admittedly privileged life. The son of an archdeacon of Northumberland, he was educated at Newcastle’s Royal Grammar School and Durham School, before spells at both Cambridge and Oxford Universities. He became a tutor at Oxford, before eventually returning to Tyneside as Rector of Ryton in 1807. He remained in the post for 55 years. Rising through the ranks, he was also created Canon (1829), and then Archdeacon (1831) at Durham, before becoming the very first Warden of the University of Durham in 1832 – playing a major role in the founding of the institution. He also became, simultaneously, the university’s first Master. As if that wasn’t enough, he became a Fellow of the Royal Society in 1839. Even that, in fact, wasn’t anywhere near enough. He was years ahead of his time in many other spheres of society. Firstly, of course, there was education, where he set up a free school in Ryton; then there was the establishment in the town of the country’s very first ‘penny bank’ (enabling those on low incomes to save and borrow at reasonable rates); and he was also a bit of an environmentalist, planting trees in the churchyard as well as purchasing the Farne Islands and appointing a wildlife warden. Just as notable were his activities on the international front where he campaigned tirelessly against slavery. In Sierra Leone his efforts were especially worthy – to the extent of setting up a university for freed slaves in the country’s capital, Freetown. He was married twice, and died in Durham in 1862. He was buried in Ryton churchyard. reuse under this CreativeCommons Licence. Situated where it is – a few miles upstream from Newcastle on the north bank of the Tyne – the settlement of Lemington was ideally placed to contribute significantly to the economy of Tyneside in its own special way. It was for centuries the point where many local collieries offloaded their coal onto waiting boats for export, and the make-up of the terrain thereabouts triggered the establishment of many other industries. 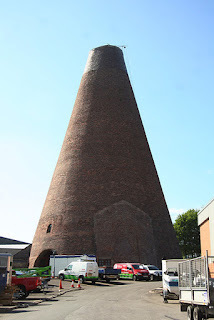 One such speciality was glass-making, and the one remaining glass cone – a famous local landmark – is in itself rather special, being one of only four of its kind left in the UK. Originally, in 1787, four glasshouses were built on the spot, and four cones were quickly added – the pride and joy of the newly-established Northumberland Glass Company, who had leased the site from the Duke of Northumberland. The chimneys’ striking form was designed to draw air up through underground tunnels to heat the glass to 2000°C. Glass production – originally flat glass – continued there until 1882, when the site was taken over for a short while by an ironworks. A depression in the glass industry had led to the decline, and in fact three of the four cones were demolished in 1837. Only by chance, it seems, did a single specimen survive into the Victorian era. The industry picked up again in the 1890s and famous glassmaker, George Sowerby, reinstated operations at the ‘cone site’ in 1898. In 1906, the General Electric Company purchased the establishment from the Duke of Northumberland and the site was expanded and refitted for the production of light bulbs and tubes. Another refit/expansion took place in 1920, and the manufacture of light bulbs and related lampware (mainly industrial and technological items) limped on through the 20th century. The last glass was produced there in 1997. Lemington glass cone was the last operational glassworks of its kind, and upon closure all but the giant cone was demolished. A little prior to this, the structure – the largest of the set at 120ft and said to contain 1.75 million bricks – was restored and given protected status. It has since been home to a variety of businesses. On a quiet byway on the north bank of the River Tyne a few hundred yards east of Wylam, lies a lucky survival of North-East history. 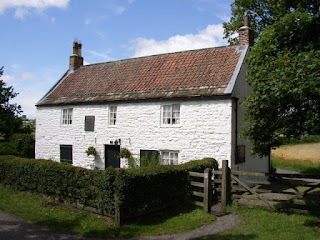 For, sitting sedately on a former waggonway out of the reach of motorised vehicles, can be found a modest cottage whose claim to fame is that it is the birthplace and childhood home of the ‘Father of the Railways’, George Stephenson. It is nothing much to look at, made to seem all the more modest due to the fact that four families lived here at the time of the famous man’s birth – each crammed into a small apartment in the tiny two-storey abode. Humble beginnings indeed for the the little chap with the big future, who entered this world on 9th June 1781. We are told in an 1857 account that… The lower room in the west end of this house was the home of the Stephenson family, and there George Stephenson was born, the second of a family of six children ... The apartment is now, what it was then, an ordinary labourer’s dwelling; its walls are unplastered, its floor is of clay, and the bare rafters are exposed overhead. Bizarrely, the cottage is now painted white. Until around the turn of the millennium it bore its original bare stone walls. Institutionalised vandalism? On the north side of the B6318 midway between Throckley and Heddon-on-the-Wall stands a terrace of houses known as Frenchman’s Row. They aren’t the original buildings (being replaced in the 1960s), but the name is a strange survival from a former age. Moreover, the more substantial eastern-most structure was for years the famous Royal French (or Frenchman’s) Arms pub. But where, one might wonder, does the strange name come from? It all dates back to 1796, when the lessees of Heddon Colliery built a row of flats on the spot for their workmen. They were stone-built, and had an outer flight of steps and a gallery. 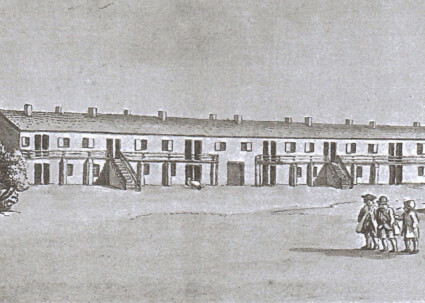 However, before so much as a single collier had moved in, three ships full of French refugees arrived – being Huguenot clergymen fleeing the shenanigans on the continent – and the new accommodation was used instead to house 38 of these individuals. The Frenchmen stayed until 1802, when they were able to return to their homeland – leaving a sundial as a parting gift (still to be seen today on the rebuild terrace). Despite their short stay, though, the name ‘Frenchman’s Row’ stuck. The buildings were used as a poor house for a time, but were renovated and relaunched as accommodation proper in 1883. The more substantial building at the eastern end was not added until 1897 and became the Royal French Arms (a small beer-house had originally been housed in the end house of the ‘row’). The original row was eventually demolished in 1960, to be replaced by the current affair in 1962 – but the name was retained. And the Victorian pub has now been converted into apartments, but is still known as ‘Royal French Court’.